Mill scale is the flaky surface of hot worked steel and is formed by the oxidation of the steel surface during reheating, conditioning, hot rolling, and hot forming operations. It is one of the wastes generated in steel plants and represents around 2 % of the produced steel. 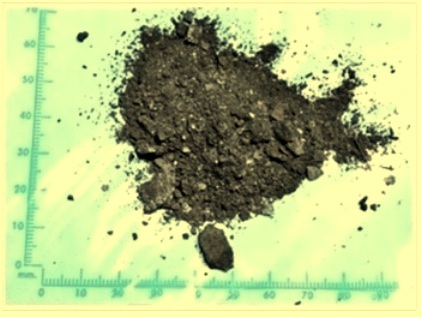 It is a hard brittle coating of several distinct layers of iron oxides formed during the processing of steel and composed mainly of iron oxides and may contain varying amounts of other oxides and spinels, elements and trace compounds. It flakes off the steel easily. Mill scale is normally present on rolled steel and is frequently mistaken for a blue coloured primer. The very high surface temperature combined with high rolling pressures result in a smooth, bluish grey surface. Under visual inspection, mill scale appears as a black metal powder made up of small particles and chips. Its physical state is solid and powdered. The specific gravity of mill scale is in the range of 5.7 to 6.2. Mill scale’s melting point is around 1370 deg C and boiling point is around 2760 deg C. It has a stable state and is insoluble in water and alkalis but soluble in most of strong acids. It is normally classified as non dangerous waste material. Fig 1 shows a small pile of mill scale. The size of the mill scale normally varies from dust size in microns up to usually 6 mm. The average mill scale obtained during the hot working of steels has iron content ranging from 68 % to 72 %. The iron in the mill scale is present in different chemical forms as given below. Magnetite, Fe3O4, of characteristic blue gray ‘steely’ color. An extremely thin outer film of hematite, Fe2O3. The inner portion of the magnetite contains fine metal grains and sometimes, residual ferrous oxide as FeO, typically black colored. Mill scale may contain C, Si, Ca, Na, Al, Mn and other metal oxides. The allowable limit for oil content in the mill scale is less than 1 % for all uses except batteries and melting charge for which upto 3 % is allowed. Typical chemical analysis of mill scale sample is given in Tab 1. The bulk chemical compositional analysis of mill scale is normally carried out using X?ray fluorescence [XRF] spectrometry by the fused bead technique or with the original substance. For the fused bead method, typically, a 0.5 to 1 gm portion of finely ground and ignited mill scale is mixed with alkali borate [e.g. lithium meta borate] in the ratio 1:10 (sample:borate) and the mixture is fused and cast into a circular glass bead. When the original substance is used, it is finely ground and mixed with a binding agent. The resultant test sample is subsequently subjected to multi element analysis by XRF spectrometry using well established calibration. The FeO content is determined separately by a wet chemical procedure in which a portion of finely ground mill scale is dissolved in hydrochloric acid in non oxidizing conditions and the resulting iron (II) in solution is determined by redox titration, e.g. with potassium dichromate. Metallic iron content is determined by dissolution of the metallic iron in bromine methanol and, after evaporation of the solvent mixture the residue is dissolved in sulphuric acid and the iron is determined by redox titrimetry after reduction of iron (III) to iron (II). There are no existing EN standards for the multi element analysis of mill scale by XRF spectrometry or for the determination of FeO by redox titrimetry. However, there is a related ISO standard [ISO 5416:2006] for the determination of metallic iron in direct reduced iron that can be applied to mill scales. Multi element analysis of mill scale provides the overall concentrations of the main constituents of the product, but does not give any indication of the identity of the individual compounds or chemical phases present, i.e. the mill scale mineralogy. Quantitative phase analysis of all the major chemical phases present in mill scale can be achieved only by means of X?ray diffraction [XRD] analysis combined with Rietveld data analysis. The identified mineralogical phases present in mill scale are hematite (Fe2O3), magnetite (Fe3O4), and wustite (FeO). The principal variation in mill scale mineralogy is in the relative proportions of iron oxide phases of hematite, magnetite and wustite. The relative concentrations of which may vary dependent upon the thermal history (holding time, heating rate, final temperature, oxygen potential etc.) of the steel substrate. The concentrations of other elements in mill scale are dependent upon the composition of the steel substrate with regard to alloying elements. In the rolled product coming out of the rolling mill, ,mill scale is usually less than 1 mm thick and initially adheres to the steel surface and protects it from atmospheric corrosion provided no break occurs in this coating. If mill scale is a uniformly well adhered covering to the steel section, then it would make an ideal protective barrier. Unfortunately, mill scale is not uniform, nor is it well adhered. Mill scale is less reactive (more noble) than the steel underneath, and consistent with the behaviour of two dissimilar metals when in contact, the more reactive metal (in this case steel) will oxidize (rust) at the expense of the less reactive metal (mill scale). Because it is electro chemically cathodic to steel, any break in the mill scale coating causes accelerated corrosion of steel exposed at the break. Mill scale is thus a boon for a while until its coating breaks due to handling of the steel product or due to any other mechanical reason. The mill scale when it pops off the surface of the substrate steel cracks the coating and allows moisture to penetrate. This allows a galvanic reaction to occur which results in pitting corrosion (rust) to the base steel. This results into a growth of the corrosion under the scale and produces further cracking to the coating and exposes greater areas and thus more corrosion. The mechanism of the mill scale induced corrosion is shown in Fig 2. Mill scale is a nuisance when the steel is to be processed. Any coating applied over it is wasted, since it will come off with the scale as moisture laden air gets under it. All mill scale need to be removed to present a uniform and clean surface of the substrate steel for any application of any coating on the steel. Mill scale refers to a form of byproduct that is mixed with water usually a coolant used in various processes for steel shaping. Although this material holds a high level content of iron of 68 %-72 %, it is sold very inexpensively as an industrial waste in the form of iron oxide, rather than collected through a recycling process. Most of the mill scale in a steel plant is recycled either in the production of iron ore sinter or iron ore pellets which are used either for reduction in iron making furnace or as a coolant in a steel making furnace. Mill scale recycling is also being done by briquetting it after mixing with a binder. Besides these several other uses for mill scale have been developed. The main uses of mill scale are enumerated below. Mill scale is being increasingly traded as a bulk cargo. However in order to have mill scale fit for sea carriage, the stockpile is always typically accumulated at port from different sources, having different particle sizes due to the way the material has been previously handled, hence resulting in individual stockpiles not being homogeneous. This indicates that no two consignments share the same characteristics, even if they are coming from the same port or shipper. It is also a cargo that tends to drain water easily, accumulating at the bottom of a stockpile to form a ‘wet base’. Mill scale is traded effectively in the same manner as primary mined iron ore fines since the physical nature of mill scale is similar to primary mined iron fines. However, it is to be noted that the mill scale is not a proper ‘bulk cargo shipping name’ (BCSN) under the IMSBC (International Maritime Solid Bulk Cargoes) Code. It is a cargo that is not listed in the IMSBC Code. IMO (International Maritime Organization) Circular DSC.1/Circ.63 of 12 October 2010 states that iron ore fines are a cargo that may liquefy and are therefore a ‘Group A’ cargo. ‘Group A’ cargo under the IMSBC Code is a cargo that may liquefy if shipped at moisture content in excess of its transportable moisture limit (TML). The terms of this circular also applies to mill scale even though mill scale is normally carried in a dry condition with moisture content below its TML. The IMSBC Code also warns about the potential liquefaction hazard of all fine-grained mineral cargoes shipped with inherent moisture content, regardless of whether or not the cargo is specifically identified as a ‘Group A’ cargo in the Code. Appendix 3, Para 2.1 of the code states; “Many fine-particle cargoes if possessing a sufficiently high moisture content are liable to flow. Thus any damp or wet cargo containing a proportion of fine particles should be tested for flow characteristics prior to loading”. Mill scale does have fine particle sizes with significant inherent moisture content, and fall therefore within the scope of this provision. Therefore, mill scale cargoes are treated as cargoes that may liquefy unless testing shows otherwise. For ‘Group A’ cargoes, SOLAS (safety of life at sea) and the IMSBC Code require shippers to provide the Master with a certificate of the moisture content and the TML prior to loading. Mill scale often exhibits a ‘wet base’. This occurs when the material drains well and accumulates water at the bottom of the stockpile. Because of this drainage, the upper sections can appear quite ‘dry’. The wet base nature of mill scale makes it vital that any moisture sampling prior to loading does not just focus on the surface area of any stockpiles, and that a fully representative sample is taken. The need for representative sampling is also vital for the determination of the TML, particularly due to the variable nature of the material. In order to sample stockpiles mechanical excavators are necessary as manually digging into the piles is impossible. Finally, due to the high density of this cargo, the trimming requirements as detailed in the Code are that it should be trimmed flat for the voyage to distribute the weight evenly across the tank top. Wet base cargoes are prone to cargo shift as the bottom liquefies and the top of the high-density stow becomes free to slide around over the wet base. The only remedy for that is to trim properly.